What I need is an easy way to inspect the other tasks/stacks. 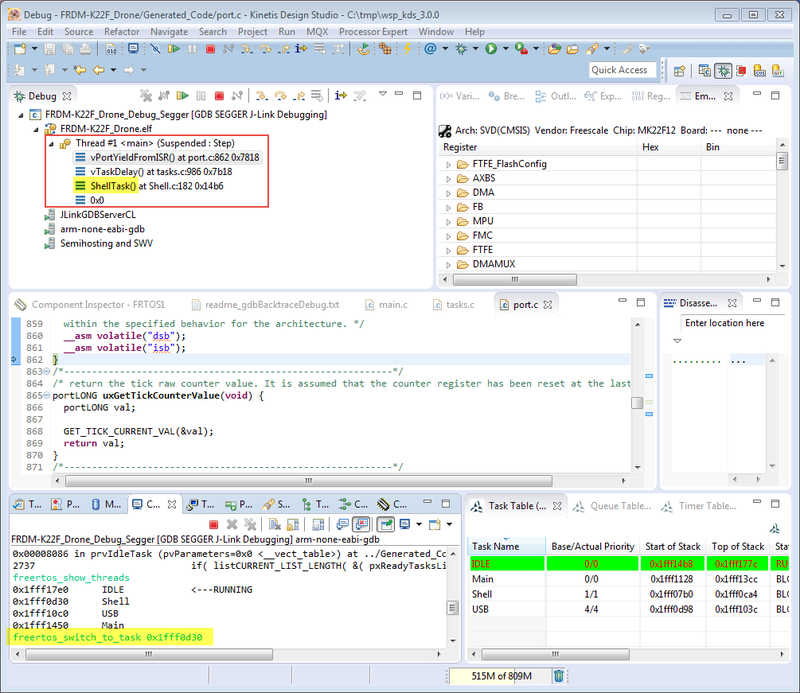 Wittenstein/High Integrity System Plugins (see DIY Free Toolchain for Kinetis: Part 5 – FreeRTOS Eclipse Kernel Awareness with GDB): free-of-charge, but not open source, need to register/download from Wittenstein. They show tasks/queues and timers. But do not allow to switch to a given task stack. Plugin from Code Confidence (http://www.codeconfidence.com/freertos-tools.shtml). This is not open source and not free-of-charge (100 GBP per developer seat, so out of reach for our classes). Additionally, it requires a special launch configuration, so the GNU ARM Eclipse launches are not supported. There is a demo mode which allows 2 threads, and debugging is terminated after 2 minutes. I searched the internet for something what would help me to see the task stacks/threads, and have found a cool contribution in the FreeRTOS community under contributed ports (http://interactive.freertos.org/entries/23468301-Tasks-backtrace-switcher-viewer-snippet-for-debugger-gcc-gdb-ARM-Cortex-M3-MPU-port-Eclipse-support-): it is an excellent example how GDB commands can be used to customize debugging :-). 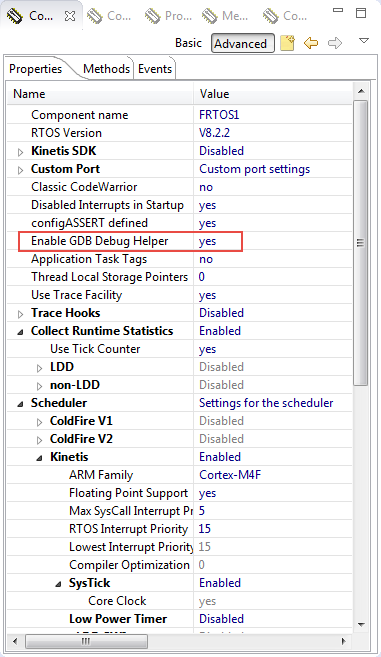 The GDB script is using/setting variables which are then used by the GDB script to switch context. That’s actually a really cool idea, and I got that approach working quickly. I need to add the custom gdb commands from the .gdbinit-FreeRTOS-helpers script file. 💡 With GDB and the GNU ARM Eclipse plugins, the current directory of GDB is the project root folder. Otherwise you need to specify the full path to make sure GDB finds the file. Now I can inspect the call chain of that thread. IMPORTANT: do not step, only inspect the stack. More about this later. The same way I can inspect other task stacks or to set breakpoints in tasks. So it is important to understand that the script actually executes code on the target. That’s why it is important not to continue stepping inside a switched context unless you know that you do! Basically switching context actually really switches the context through the GDB debugger. That GDB helper works fine for me, and makes debugging a FreeRTOS application much easier. Best of all: it does not need a plugin, but works with normal GDB commands so can be adopted/changed easily too. All the sources are available on GitHub. Consult the links at the end of the article. 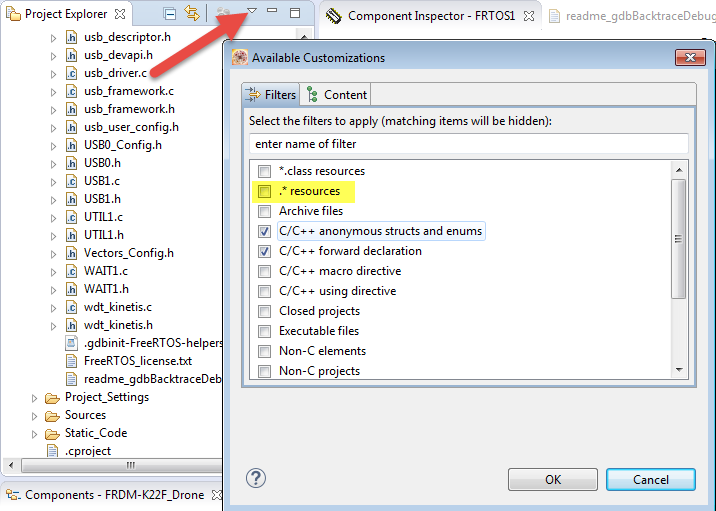 The FreeRTOS component will be available with the next release on SourceForge. If you want to get and try the current .PEupd file before the ‘official’ release, contact me by email (see About), and I make it available. I was hoping as well to find a nice GDB front end or something I can add buttons easily to Eclipse without writing a plugin? Anyone has an idea? Maybe we could together build an open source plugin? Looking for volunteers :-). 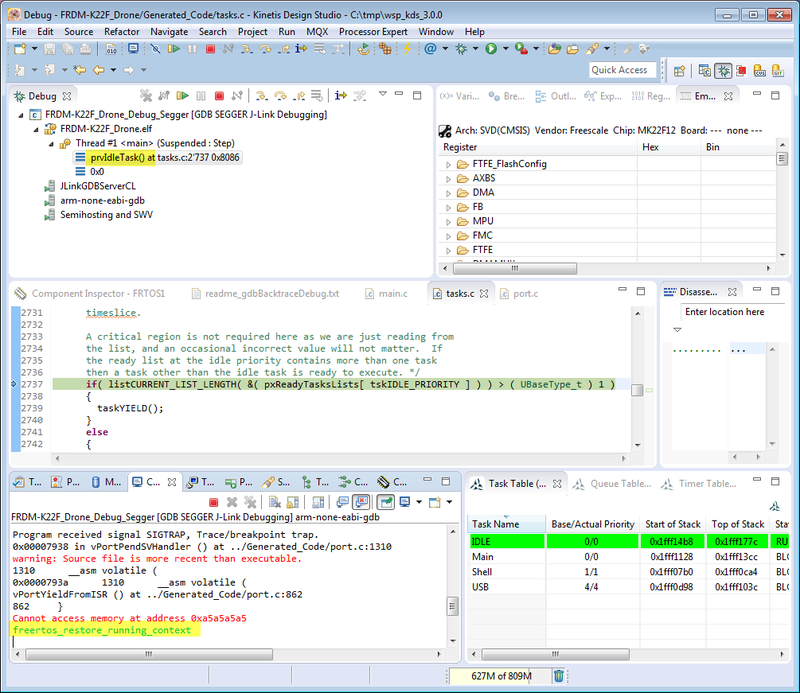 This entry was posted in ARM, CPU's, Debugging, Eclipse, Embedded, Embedded Components, FreeRTOS, Freescale, Processor Expert, Tips & Tricks and tagged arm gcc, Debugging, Eclipse, Embedded Component, FreeRTOS, Freescale, Processor Expert, technology, Tips&Tricks by Erich Styger. Bookmark the permalink. Otherwise I would get strange assembler error messages. ah, yes: that’s because I use this file with Processor Expert, and Processor Expert will read/copy it. To have a ‘%’ in the final source I need to use ‘%%’. So yes, if you want to use that code right away, you have to use only ‘%’. Would it be possible to use the gdbscript to do the things the modified PendSV handler does? It is basically a forced task switch back and then forth. All the registers which are popped and then pushed back could be modified by the debugger itself. Or is there something that I missed? Yes, I think this would be possible too. This reminds me of a company I used to work for (2007 – 2010). They use Nucleos on an embedded processor and 700kB of software divided over 40+ tasks. After a few years they stopped paying $$$ every year for their rtos and in the 3 years I worked there nobody was able to figure out how to get a debug interface working. (Spent almost a week on it myself). The only available uart was dedicated as an “upload” port for new firmware. All I had were 4 user led’s and a vga monitor on which I could squeeze 1 or 2 text lines of “extra” debug code. I have vivid memories of a bug on which I spent a lot of time tracking down. After eliminating more than 95% of the code I had to gave up. One of my colleagues took over and he eventually found the bug wit a logic analyser. It was an overflow in a 16bit pointer in the nucleus kernel which should have been a 32bit pointer. Because the maintenance contract with nucleus was expired we did not even bother to report this back to them. In that company they are probably still staring at those 4 leds. ah, that’s why! The files get copied by Processor Expert into the project, and ‘%’ starts a special command/variable. To copy ‘%’ I have to specify ‘%%’. Sorry for the problem. 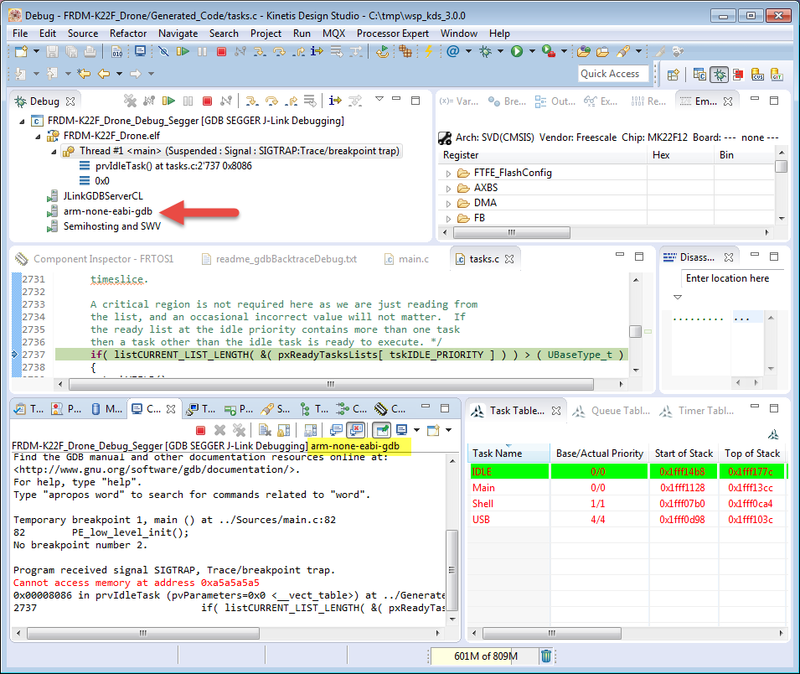 i went back to this topic as i wanted to have the current state of different tasks and their call stacks shown in eclipse. as it turns out, openOCD brings some support for this. I never liked openocd because it was slow and unreliable. but maybe it’s time to give it another try. I will try my luck with recent versions of FreeRTOS and openOCD tomorrow. 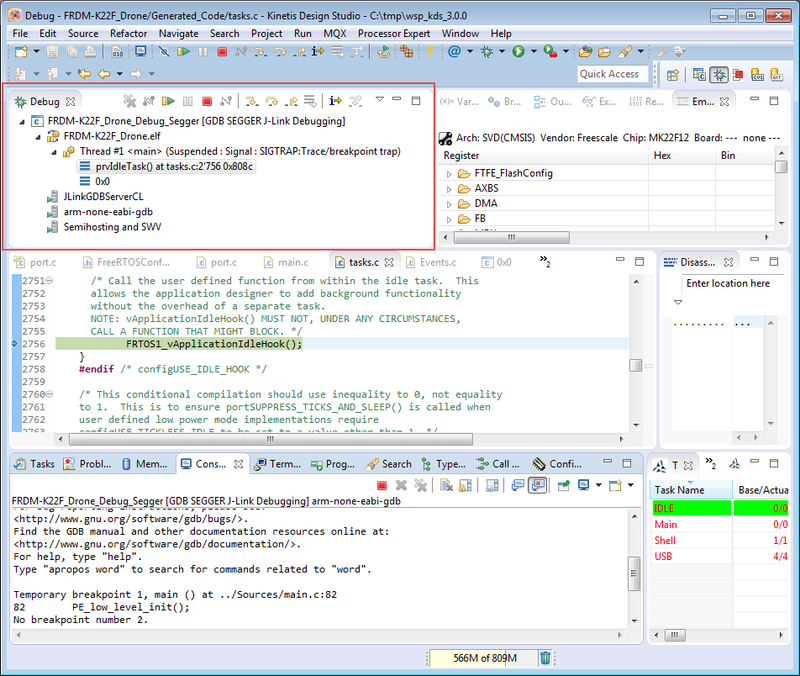 after some problems I made to myself, I was able to get the thread view up and running in the eclipse debug perspective. I will comment on the down sides later. the most important step, which I was to stupid to get right in the first place was the following command line for openOCD. 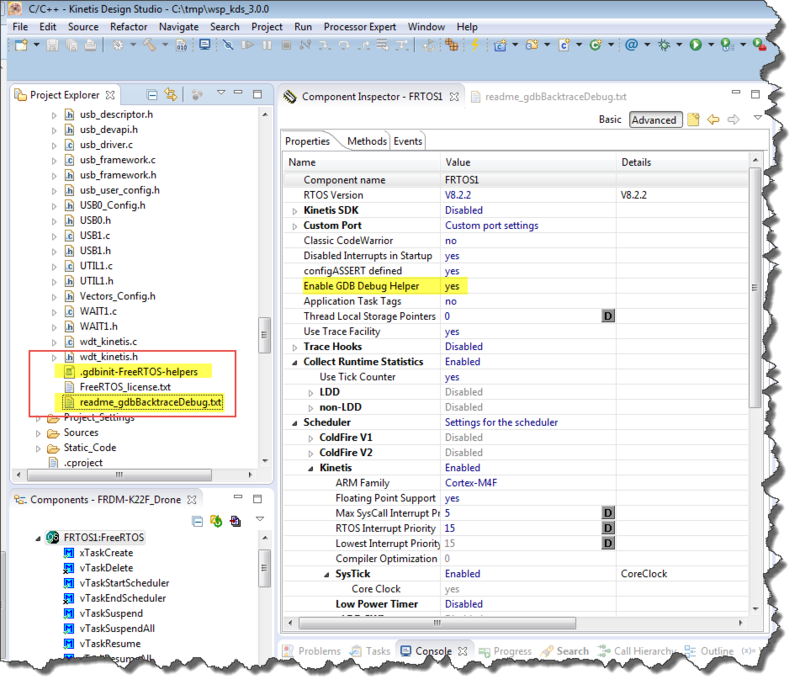 i entered this directly in the “config options” box in the OpenOCD debugger config of GNU ARM eclipse. I quit using OpenOCD because it’s slow and unreliable. And this is still true. gdb is asking for the “info thread” command on each single debugging step you make which makes it really unpleasant to step through the code. maybe this could be improved by using J-Link instead of st-link debugger but my experience using this setup was also not nice. eclipse also loses the back trace of the shown threads if you to a single step. you need to change the perspective to c/c++ and back to debugging to make the backtrace appear again. Interesting, thanks for sharing! I had bad experience (very slow and buggy9 with OpenOCD 0.8.0 too, so I pretty much stopped using it and using P&E and Segger instead.